The paint on the flagpole hasn't dried properly so brought it in next to the fire to finish it off. Instead of fixing it up I went for a local walk instead. There is a bridge not far ahead of the boat that leads to a car park so had a wander over to take a pic of the mooring. Quiescence is moored outside of Abigail Jenna but you can just about see my yellow box on the bows and the wide beam Shamrock that moored astern yesterday. Tim has a problem with his wind genny. It is exactly the same as mine but while mine is spinning like a good one his just turns into the wind and sits there refusing to go round. It does not seem to be as free as mine so it might be a bearing problem. Walking up the road past Tesco I noticed that the Minister (St George) is open to the public today. In I went to have a look around. An impressive place and full of stained glass from the 19th century. The church was designed by Sir George Gilbert Scott after its medieval predecessor burnt down in 1853. He was quite prolific in his output and worked on some notable buildings. Sir George Gilbert Scott (13 July 1811 – 27 March 1878) was an English architect of the Victorian Age, chiefly associated with the design, building and renovation of churches, cathedrals and workhouses. Born in Gawcott, Buckingham, Buckinghamshire, Scott was the son of a clergyman and grandson of the biblical commentator Thomas Scott. 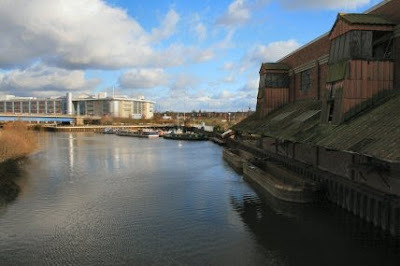 He studied architecture as a pupil of James Edmeston and, from 1832 to 1834, worked as an assistant to Henry Roberts. He also worked as an assistant for his friend Sampson Kempthorne. 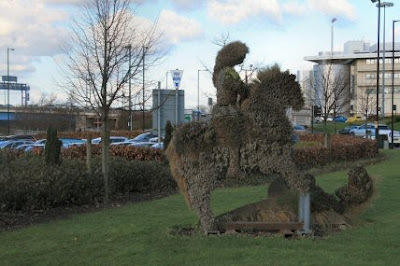 Out of the Minister and towards the A19 roundabout I saw the 'statue' of George and the Dragon made from plants. It will look much better when spring arrives and there is some growth put on. He does have a problem in the killing of the dragon for he is missing his lance and the dragon in this case looks as though it is being trampled to death by the horse. Do they know something of the story that has been kept from us. Conspiracy! !